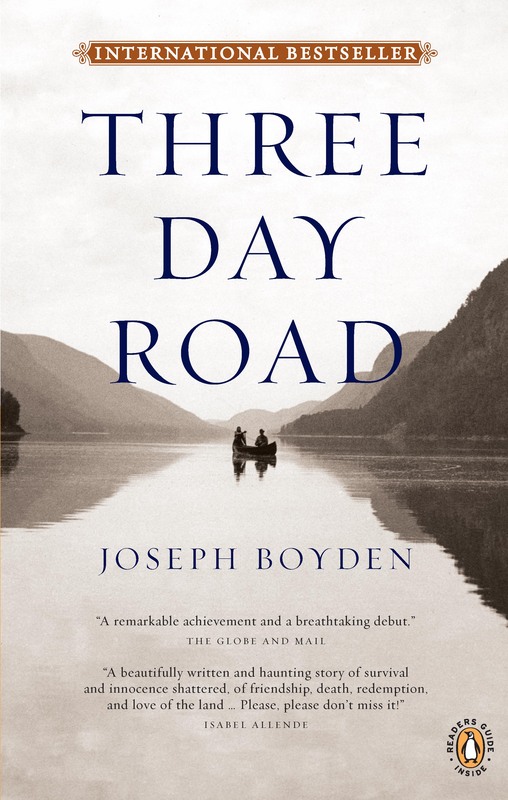 Award-winning author, Joseph Boyden’s novel, Three Day Road, is the book selected for the 2006 One Book, One Community program. In Three Day Road, it is 1919, and Niska, the last Oji-Cree medicine woman to live off the land, has received word that one of the two boys she grudgingly saw off to war has returned. She leaves her home in the bush of Northern Ontario to retrieve him, only to discover that the one she expected is actually the other. Xavier Bird, her sole living relation, gravely wounded and addicted to the army’s morphine, hovers somewhere between the living world and that of the dead. As Niska paddles him the three days home, she realizes that all she can offer in her attempt to keep him alive is her words, the stories of her life. In turn, Xavier relates the horrifying years of war in Europe: he and his best friend, Elijah Whiskeyjack, prowled the battlefields of France and Belgium as snipers of enormous skill. As their reputations grew, the two young men, with their hand-sewn moccasins and extraordinary marksmanship, became both the pride and fear of their regiment as they stalked the ripe killing fields of Ypres and the Somme. Inspired in part by real-life World War I Ojibwa hero Francis Pegahmagabow, Three Day Road is beautifully written and told with unblinking focus, it is a remarkable tale, one of brutality, survival, and rebirth. Three Day Road has received the Rogers Writers’ Trust Fiction Prize and the McNally Robinson Aboriginal Book of the Year Award and has also been shortlisted for the Governor General Award for Fiction. Three Day Road also made the shortlist for the CBC’s Canada Reads series. Joseph Boyden is a Canadian with Irish, Scottish, and Métis roots. He divides his time between Northern Ontario and Louisiana, where he teaches writing at the University of New Orleans. In 2006, Boyden was on the shortlist for the CBA Libris Award – Author of the Year. He is the author of Born with a Tooth, a collection of stories that was shortlisted for the Upper Canada Writer’s Craft Award. His work has appeared in publications such as Potpourri, Cimarron Review, Blue Penny Quarterly, BlackWarrior, and The Panhandler.